Two veteran Cosmonauts are set for a busy spacewalk outside the International Space Station on Wednesday to complete a series of tasks related to the removal and installation of different scientific experiments on the Russian Segment of the orbiting laboratory as well as other reconfigurations on the exterior of ISS. 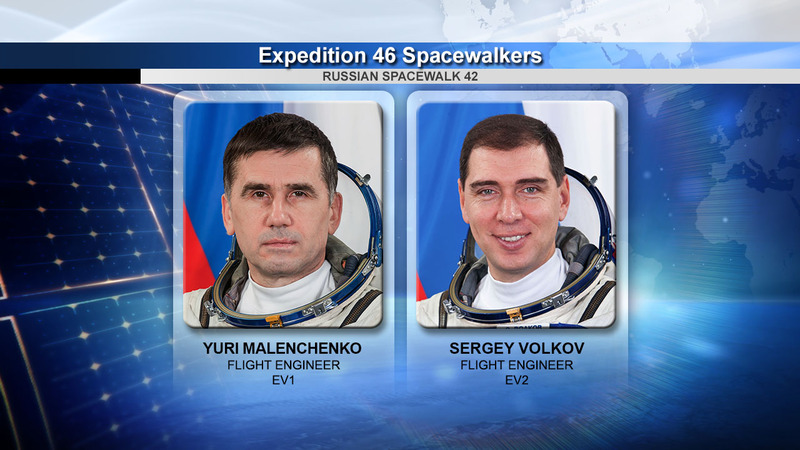 Yuri Malenchenko and Sergei Volkov, both with previous spacewalks under their belts, will spend about five and a half hours outside as part of the 42nd Russian EVA on ISS. Serving as the lead spacewalker, Yuri Malenchenko brings plenty of experience from five previous EVAs totaling over 30 hours spent outside. He completed his first two EVAs back in 1994 on the Mir Space Station followed by a spacewalk using U.S. Spacesuits in 2000 when ISS was still in its early assembly phase. 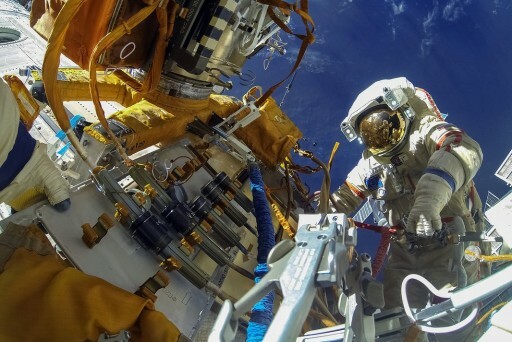 Malenchenko again ventured out into the vacuum of space in 2007, also using the EMU, with his most recent spacewalk having taken place in 2012 out of the Russian airlock using the Orlan suits. 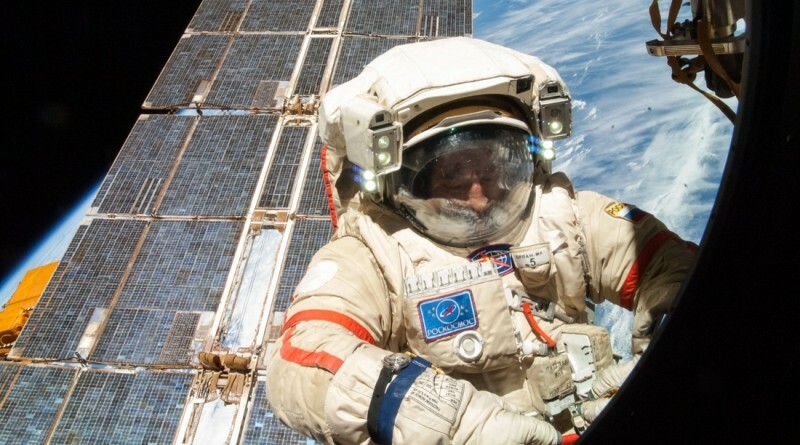 Sergei Volkov can look back at three spacewalks conducted as part of his two previous long-duration missions to ISS with a total career EVA time of 18.5 hours. He served as lead spacewalker for two EVAs in 2008, performed with Oleg Kononenko and conducted his third EVA in 2012 – all using the Pirs module of ISS as Airlock. Pirs and the two Orlan space suits to be used on Wednesday went through several weeks of preparations including checkouts of the two space suits and the EVA support systems inside the Pirs module. 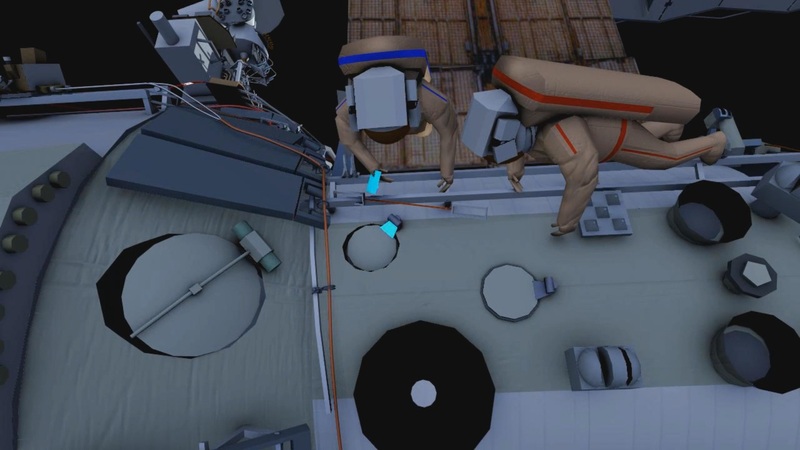 The two spacewalkers made fit checks inside their suits and completed several review sessions to study procedures and translation paths, also making use of virtual reality trainers. Their Orlan suits were outfitted with USOS equipment such as lights and cameras and the crew members completed a last rehearsal and translation exercise in their suits on Monday. Wednesday’s spacewalk – the 193rd dedicated to ISS Assembly & Maintenance – is expected to commence at 13:10 UTC and has a number of objectives. The spacewalking duo will be tasked with the removal of the Expose-R space exposure experiment that was installed on the exterior of ISS for one and a half years, the removal of an CKK exposure experiment and the installation of its successor, the installation of the next Vinoslivost materials science experiment, the reconfiguration of the БКДО Plume Impingement and Deposit Unit, the installation of gap spanner hand rails, and the completion of the “Test” and “Restoration” experiments. 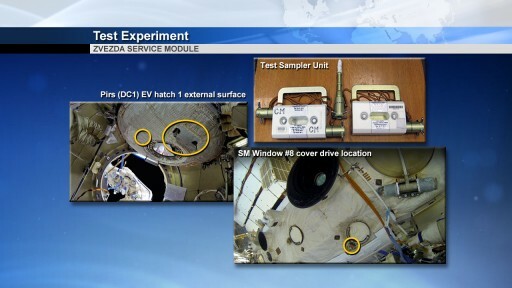 The Test Experiment aims to obtain swab samples from the various surfaces on the exterior of the Space Station to study weathering of different materials in the space environment characterized by harsh thermal variations, high doses of radiation and atomic oxygen causing corrosion. The Test Samplers consist of pairs of collection devices for the acquisition of swab samples and containers to protect the samplers. 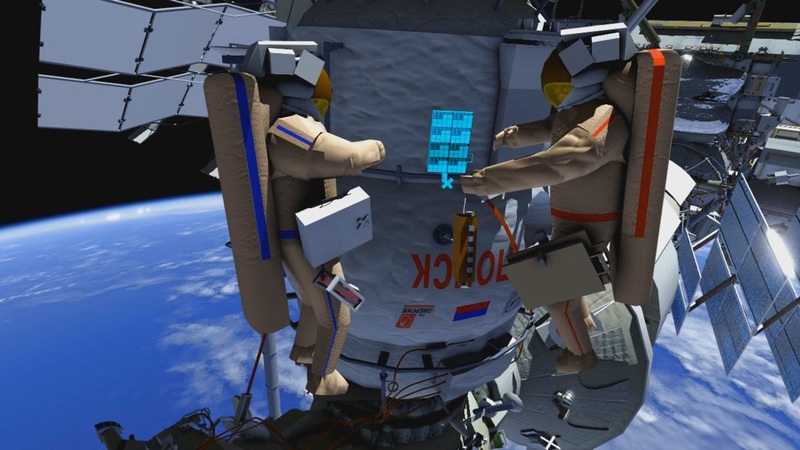 Volkov will be tasked with the collection of samples from Window #8 on Zvezda using the samplers to swab the outer ring of the window as well as the window surface itself and the cover drive mechanism close to the window. Samples collected from the various surfaces and areas are returned to Earth for laboratory analysis to point to any substances that may be accumulating on the windows (propellant residuals and other substances) or show any signs of corrosion on the window shell or even microbial activity. This study provides valuable engineering information, but is also of scientific value. Test samples are also to be collected from the external surface of the Pirs airlock hatch, either at the start or the end of EVA-42. Moving on, the two spacewalkers will translate Station Aft to reach the URM-D Universal Work Platform on Plane II of the Zvezda module where the Expose-R experiment is installed. Expose-R hosts a number of different samples and experiments deployed to space in August 2014 by spacewalkers Oleg Artemyev and Aleksandr Skvortsov in order to spend an extended period of time in the space environment before being returned to Earth for detailed analysis. 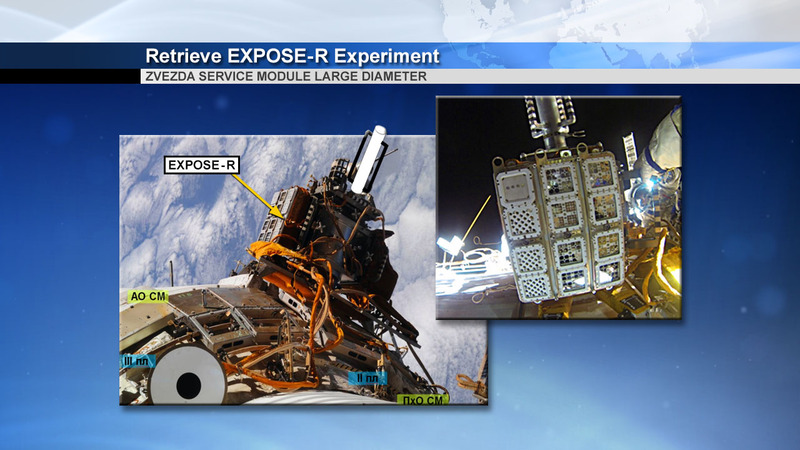 Arriving at the worksite, the spacewalkers will collect close-up photos of Expose-R to document its condition before installing a protective cover atop the experiment payload’s upper face. Next, they will open up the FP-20 electrical patch panel where the 20-2 and 20-3 connectors will be disconnected. These connections were used to deliver heater power and data connectivity to Expose-R for the downlink of health data and measurements of the environment the payload endured. Once the connectors are demated, the Expose-R monoblock will be detached from the URM-D to be transported back to Pirs. 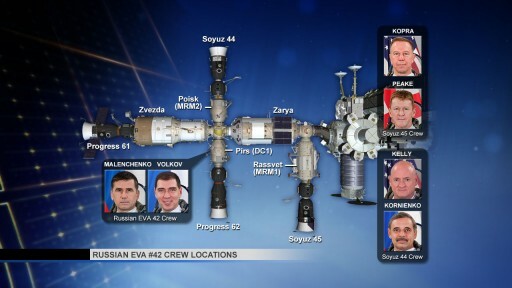 Back at the Pirs Airlock, the EVA crew will stow the Expose-R payload and retrieve the Vinoslivost and SKK (CKK) experiment payloads and a tool bag containing gap spanners. Malenchenko and Volkov will then translate to the Poisk Module, using the deployed Strela boom as a translation path between the two modules. 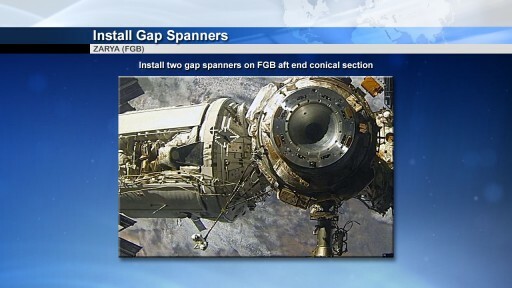 Based on handrail 6032, the spacewalkers will remove and secure the CKK No. 2-M2 experiment container which had been installed back in August 2014. In its place, the crew will put the CKK No. 3-M2 experiment container. 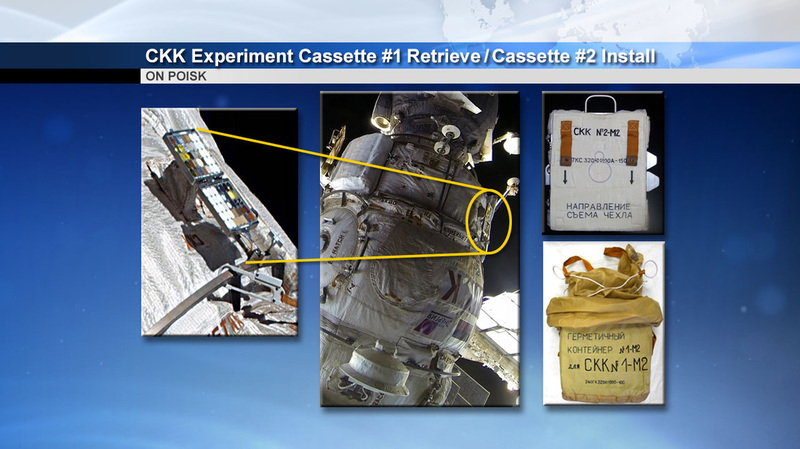 To remove the CKK suitacse-type payload, the crew will fold up the two flaps to protect the samples that are inside and detach the payload from the handrail it is installed on. The installation of the new payload is the reverse process – attaching it before opening up the flaps and avoiding any contact with the samples. 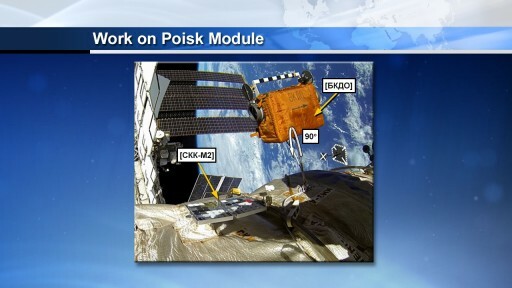 The CKK materials science experiment exposes different materials and substances to the space environment. 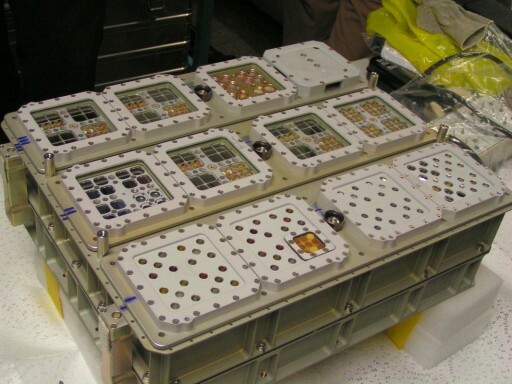 The samples are facilitated in briefcase-shaped containers that allow them to be installed on ISS for an extended period of time before being closed up and brought back to Earth. 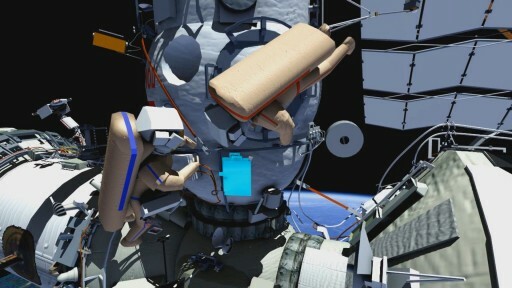 Already two and a half hours into their EVA at that point, the two crew members will take care of a simple reconfiguration of the Plume Impingement and Deposit Monitoring Unit, also known by its Russian acronym БКДО. The unit will be rotated by 90° in order to monitor a different sector in a study of the plumes created by the thrusters of visiting vehicles and the Space Station itself to learn more about the impingement characteristics of the thruster plumes and processes causing the deposition of combustion products on the external hull of the space station. Photos will be taken of CKK and БКДО before Malenchenko and Volkov translate around Poisk to find handrail 6007 to which the Vinoslivost experiment is to be attached. 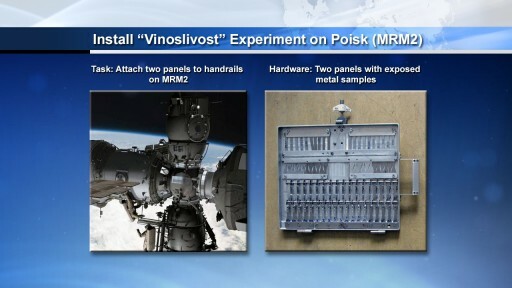 The Vinoslivost study is similar to the US MISSE experiment and looks at the performance of different materials under the harsh conditions of space – the increased UV radiation from the sun, cosmic radiation, the extreme and sudden temperature changes when moving from day to night, and atomic oxygen leading to rapid corrosion. 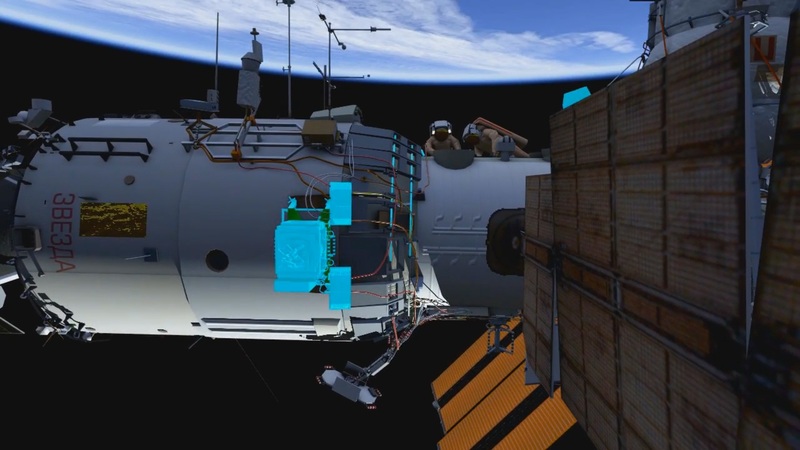 The spacewalks will then depart Poisk for the Zarya module to install a pair of soft handrails, or gap spanners to help in future EVA translations. The two gap spanners are to be installed between handrails 1504 – 1335 and 1505 – 1335. With the spanners in position and a good pull test on both, the crew will return to the Pirs airlock, stowing the CKK experiment container and retrieving the “Restavratsiya” (Restoration) Experiment for a 30-minute run based on the EVA ladder outside Pirs. The experiment looks at unique characteristics associated with the application of surface treatments in space such as thermal coatings, films and glues. The study evaluates a device designed for the application of a thermal protection foil on surfaces using an adhesive to cover repaired or reconditioned surfaces. While one crew member will handle the device, the other will collect video of the operation to enable engineers to evaluate possible improvements needed before an operational use of this type of technology in the space environment. The aim during EVA-42 is to use the device to apply the foil to a plate which will then be taken back inside for inspection. 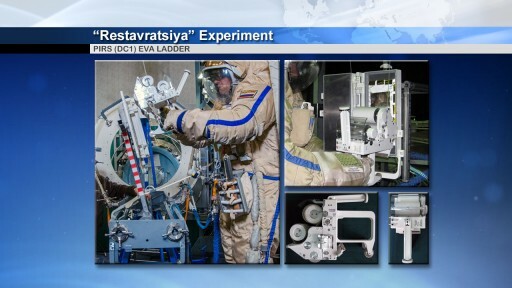 To conclude the EVA, Malenchenko will ingress the Pirs airlock followed by Sergei Volkov who will remove the protective ring and close the airlock hatch to mark the end of EVA-42 after a planned elapsed time of five hours and 26 minutes.